First things first. Drink some water. Not just plain water, but a water that will alkalize your body, readying it for nutrients. 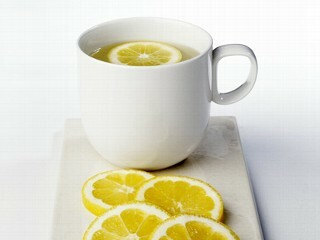 Add the juice of half a lemon to a glass of water, warmed if possible. Add an herbal tea bag or some dried Goji berries to go the extra flavor mile. Why? Alkalinity is related to Ph balance. Your digestive system is the main center of your immune system. When your body is alkaline, bacteria, viruses, indigestion, and pain have a hard time surviving. The more alkaline you are, the healthier you are. Lemon may seem acidic, but it actually turns alkaline in your body. Anything that is fresh and plant-based is alkalizing to your body. Processed foods, junk foods, and sugar are acidic. Avoid at all costs! Hit the road with protein. The best way to get your hunger under control is to start the day with some plant-based protein. Protein takes longer to digest, and increases your satiety (fullness factor). I suggest a VegaOne shake or smoothie. VegaOne has 50% of your vitamins and minerals, 15g of protein, 6grams of fiber, 1.5 grams of Omega 3’s, Antioxidants, Probiotics, and greens. Plus, it has the super foods chlorella and maca! You won’t only feel full until lunch, but energized and happy. Blend half a frozen banana, one scoop VegaOne, and 12oz unsweetened almond milk or water. If you’re in a rush, you can simply mix a scoop of VegaOne and 8oz water in a to-go BlenderBottle. (Do this at night for a grab-n-go.) The berry flavor of VegaOne is best mixed with water -and nothing else. Vanilla Chai and Chocolate are great with water, or the banana and non-dairy milk. Why? A mid-morning munchie attack before lunch time can sabotage your calorie count and weight loss efforts. It can also mean snacking on vending machine junk or the cake in the back office. Sound familiar? Candy-dish diving is just going to make you hungrier and grumpier. Be sure to get a smoothie. Why plant-based? Whey protein digests very quickly and can bloat you. Many people have dairy-sensitivities, which is where whey comes from. VegaOne doesn’t only provide you with protein and satiety- you get most of the greens, vitamins, probiotics, and minerals you need for the rest of the day. Now that’s a good start! You may have forgot to pack a lunch. You may be invited to go out to a staff lunch. And you will be tempted with that staff pizza party. If you want to be free from guilt, and health-insured, pack some security. I suggest a home-made trail mix, piece of fruit+raw almonds, or non-dairy greek yogurt. Bananas, oranges, and apples are year round fruits that are very purse-friendly. Raw almonds are full of fiber and protein; only a handful will sustain your hunger until you get home. 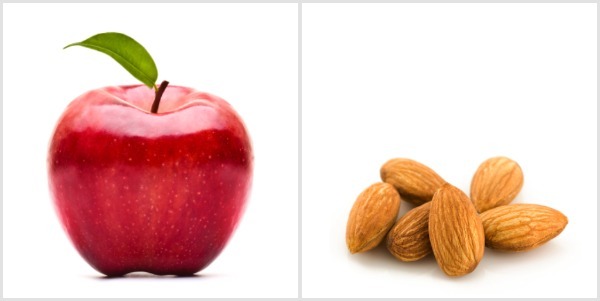 When fruit and almonds are paired together, you will get a healthy dose of carbs, good fats, and protein. Non-dairy greek yogurt, made from coconut milk (Delicious!) is also full of protein and fibers. Plus, it tastes sinful but is actually very good for you. I loved reading this because it reminds me of my work! There are CONSTANTLY potlucks, staff lunches, pizza parties, cakes, you name it. Not to mention the vending machines. It truly helps to keep my desk at work packed with raw almonds, and a rainbow of fruit on my desk top. I’m not perfect, but I am able to avoid temptation most of the time now. I keep healthy options in front of me, and I eat more. And the weight is beginning to fall off! I’m so much happier and healthier.